This leaflet specifies the main characteristics of wagons for combined transport designed for horizontal transshipment and the conveyance of road vehicles on low-floor wagons. 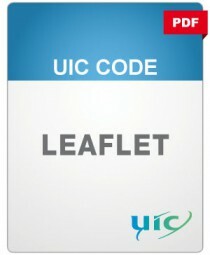 Low-loader wagons do not have a compatibility code under UIC Leaflet 596-6, since the loading units are not subject to the coding specified in UIC Leaflet 596-6. Low-loader wagons are used on domestic and international routes. They are, or shall where possible be, subject to bi- or multi-lateral agreements, and in principle are to be considered as movements which foul the loading gauge. This leaflet describes low-loader wagons and their main characteristics, and lists the technical requirements governing their use.